Hoopty Rides: Trash the Dewey Decimal System for $999! Trash the Dewey Decimal System for $999! Forget the noble beginnings of the bookmobile and public service, you can become the arbiter of taste! Your own media bias! Start trends, declare the hottest and latest by way of careful editing of your stacks. From cat staples to improvised munitions, plagues to two headed calves, venomous animals to internal combustion engines, pyromania to backwoods stills, aircraft sheetmetal repair to bathtub surgery, pulp nurse romances to jumping chollo cactus, beehive technology to carnivorous plants, death rays to model airplanes. baroque to biscuits. Imagine! Freeze knowledge to a certain year. Rewrite history! Select only that which agrees with your crackpot views. 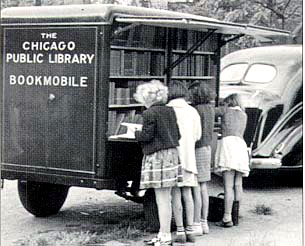 Though a handsome trailer, is it a bookmobile without a engine?